Scatter Symbols - What Makes Them Different? A scatter symbol really does have an important part to play in slot games, as you’re about to find out. Not only can it earn you cash prizes in its own right but plays a vital role when it comes to triggering bonus games, particularly in five reel games. The scatter symbol is often referred to as the slot player’s best friend and it does certainly do a great deal to live up to that title. It could also be called the key that unlocks the door to some excellent cash prizes. The expansion of games from three reels to five reels meant designers had more space to play with. This meant more symbols could be included and rather than just have more basic symbols, important symbols such as scatters, wild and bonus symbols were introduced, giving the players more chances to win. Let’s first take a look at how the Scatter Symbol can win you money in its own right. 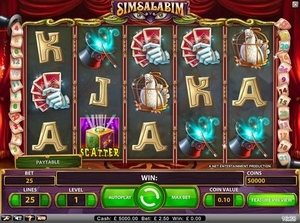 The normal situation in a slot game is to be looking for a combination of matching symbols all on the same payline. Whether it’s three 7’s or four bars, these lead to some decent wins but the scatter symbol doesn’t fit into this golden rule. Scatter symbols pay out cash prizes without having to be on the same payline. So if after a spin of the reels one ends up on payline 2 and another on payline 4 you’re on a winner. No wonder slot players are so happy to see them. When you’re watching the reels spinning it’s really important to keep an eye out for the Scatter Symbols. They can help trigger the bonus game that a slot machine has and this can really win you some excellent prizes. You don’t need to be spending lots of money activating as many paylines as possible. Often with scatter symbols in relation to triggering bonus games, they simply need to appear anywhere on the reels not an active payline. Once you get into the bonus game they still have a part to play as it’s possible that they can appear again in the required numbers and cause you to earn more free spins. For example in ‘Hawaiian Treasure’ from Ash Gaming, the tiki mask is the scatter symbol. If three of those symbols appear anywhere on the reels then this takes you into the bonus game and the chance to win some great cash prizes. 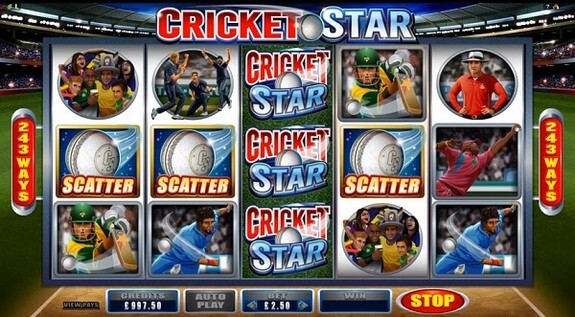 In Microgaming’s ‘Cricket Star’ the scatter symbol has an even more important part to play. The white cricket ball is the scatter symbol and you need three of them to trigger the bonus round and receive 10 free spins. However, if you can get four of the scatters then that goes up to 15 and five on the reels gives you 25 free spins. So in this game you really are keeping an eye on the reels for the scatter symbol because there is so many different ways to win. The scatter symbol means there’s a lot more variety in games now. Players don’t just spend their time looking for winning combinations of symbols. They’re keeping their eyes out for the scatter symbols to see if they can secure entry into the bonus game where there are big prizes to be won. So next time you play a slot machine, take a good look through the paytable to learn if there’s a scatter symbol involved in the game. If there is the paytable will give full details of just how important it is and how its appearance can really help you boost your cash balance.